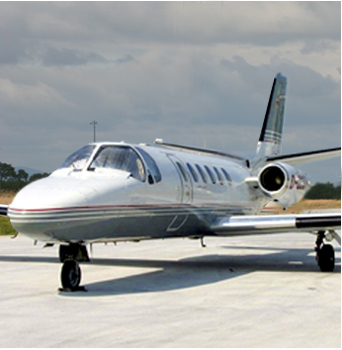 The Citation II is one of the safest and most reliable business jets worldwide. The spacious cabin with exclusive interiors boasts eight comfortable and individually adjustable leather armchairs, inviting you to a relaxing flight above the clouds. A low noise level and a travelling altitude above the weather allows for concentrated on-board working. The Citation II is the ideal choice for fast and comfortable flying.